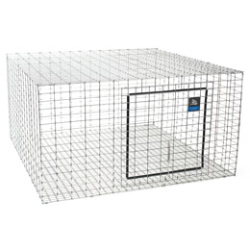 These easy assembly rabbit cages are constructed with rust-resistant, easy to clean wire mesh. Doors are surrounded by protective vinyl guards and feature spring tension door latches. Wire mesh bottom is 1 in x 1/2 in and sides are 2 in x 1 in.